Welcome to the Marvel Muster. We start things on a solemn note this month with last week’s news of the death of Stan Lee, the man who did more than anyone else to create and shape the Marvel comics universe. There have been many lovely tributes to Lee in the last few days; he influenced a lot of people’s lives, mine included. Every week I get together to read comics with my friend Elizabeth Holden. We’re twenty-eight years apart in age, we came to comics in very different eras, but we both have Stan Lee to thank for our love of the medium, and for our friendship. This week we talked a bit about what Stan Lee meant to each of us. Elizabeth: I was a kid. I read comics bought on a small allowance at Leo’s, my corner store. I read DC because that’s what was there. I was losing interest—they seemed, to my sophisticated ten-year-old tastes, to be dull and sexist—though in those days “sexism” wasn’t a word I knew. Then I discovered Stan Lee and Jack Kirby’s Fantastic Four, and fell in love with the medium all over again. Soon after that, it was The Amazing Spider-Man, by Lee and Steve Ditko, and I began haunting Leo’s in hopes of finding more Marvel comics. I was done for. Cat: I was twenty-two. I’d just left University but not yet found my first post-University job. I moved in with a friend while I searched. I didn’t have much money, but that was okay, because she had twelve long-boxes of comics in her front closet. Mostly Marvel, mostly X-Men related. It was love at first page. Elizabeth: It wasn’t the superheroics, though one of the things I love about American comics is their focus on heroism. It wasn’t just the humour, or the action, or the wonderfully real characters. It was because everything Lee wrote became brushed with humanistic insight: a nerdy teen like Peter Parker was as vivid as the battle-weary soldier Nick Fury, or the flashy patriot/engineer Tony Stark. He took the familiar tropes and twisted each one into something more complex—not to make the hero flashier or bigger, but to look deeply into motivations, fears, and challenges each character faced. He took the larger-than-life persona of a superhero, and brought it down to earth by giving the characters problems we have seen in the world we live in: poverty, bigotry, disability, addiction, family dysfunction. 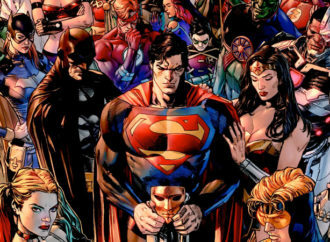 Each hero had a personal life as significant as the action of any given plot battling supervillains, and even supervillains like Magneto and Doctor Doom had significant, humanizing personal backstories. Cat: I fell in love with the X-Men, and then later with the various Avengers and other characters, because they were so incredibly human. As an anxious, queer woman, far from home and just figuring out who she wanted to be, I found much to identify with in Stan Lee’s creations. Filtered through the lens of superheroism, in characters who were people first and heroes second, I saw myself. 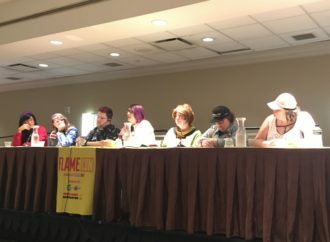 Elizabeth: Lee made the creation of comics sound like as much fun as the reading of them, and the familiar names of “the Bullpen” made us all feel like participants in a game. 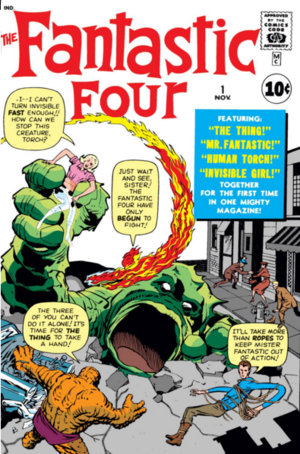 Writers and artists were not just identified with each story, but given jazzy nicknames and sometimes featured in cameos in the stories themselves, as in Fantastic Four Annual #3, where creators Stan Lee and Jack Kirby were turned away from the wedding of Reed Richards and Sue Storm. When Stan Lee spoke in “Stan’s Soapbox,” it was like listening to a friend; and this before the days when social media made every face or voice a familiar one. A friend who who was open and passionate in his opinions: anti-fascist, egalitarian, speaking out strongly against racism. It was these ideas that made comics seem meaningful to young readers like me in a way they never had before. Cat: Marvel comics have brought so much joy into my life. The comics, yes, and the movies too, but more than that the people. 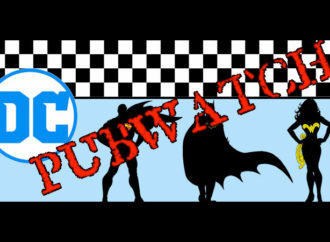 There’s a lot of toxicity in comics fandom, but there’s also a lot of passion and love, and some really great communities. I read a fairly diverse array of comics these days, but it’s the Marvel characters, and the friends I’ve made through them, that I always come back to. Marvel debuted three exciting new ongoing series in September starring young female characters. 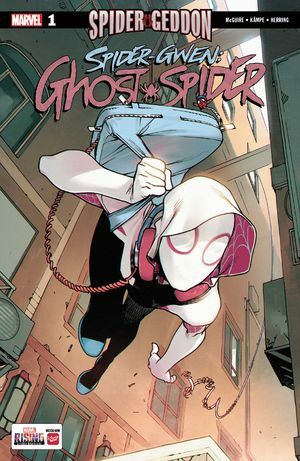 Tying into the current Spider-Geddon event, Spider-Gwen: Ghost-Spider by Rosi Kämpe and Seanan McGuire is the newest ongoing for the spider-powered Gwen Stacy who debuted during 2014’s Spider-Verse. Gwen’s two previous series were almost exclusively the product of her co-creators Jason Latour and Robbie Thompson, so it’s exciting to see a female creative team finally take on Gwen’s story. 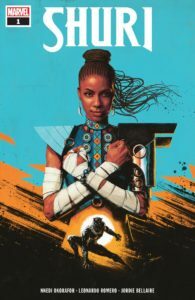 Nnedi Okorafor and Leonardo Romero’s Shuri is the character’s first solo series under her own name, although she did star as the titular character in the 2008 Black Panther ongoing by Reginald Hudlin and Ken Lashley, and then Jonathan Maberry and Will Conrad. Her appearances in the movies in Black Panther and Avengers: Infinity War has upped Shuri’s profile significantly, and now seems like the perfect time for her to step into the spotlight. The final new series in October was the return of Nadia Van Dyne and the Agents of G.I.R.L. in The Unstoppable Wasp by Jeremy Whitley and Gurihiru. 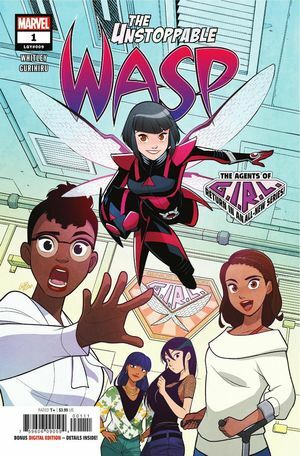 I adored the first volume of The Unstoppable Wasp and so far it lives up to the high bar set by its predecessor. In mini-series news, the Infinity Wars tie-ins really took off this month with the first two issues of Infinity Wars: Sleepwalker by Chris Sims, Chad Bowers, and Todd Nauck, the first issues of Infinity Wars: Arachknight by Max Bemis and Alé Garza and Infinity Wars: Weapon Hex by Ben Acker, Ben Blacker, and Gerardo Sandoval, and the second issues of Infinity Wars: Iron Hammer by Al Ewing and Ramon Rosanas and Infinity Wars: Soldier Supreme by Gerry Duggan and Adam Kubert, which I missed mentioning last month because they weren’t in Marvel’s September solicitations. Elsewhere, Daniel Kibblesmith and Ricardo López combine two of the biggest movie characters of 2018 with Black Panther Vs. Deadpool, Tim Seely and Carlos Villa give eponymous ’90s character Shatterstar his first solo series, and Robbie Thompson and Will Sliney helm Solo: A Star Wars Story Adaptation. 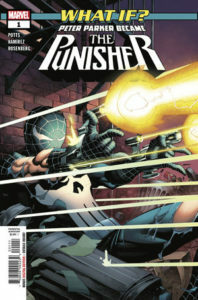 Marvel ended four series in October, one after only five issues. Announced in March and debuting in June, Jeff Lemire, Kim Jacinto, and Joshua Cassara’s Sentry singularly failed to make much of a splash, and has now been quietly cancelled after five issues. I made my opinion on Sentry very clear back in June, so I’m not at all sorry to see this series end so abruptly. Peter David and Will Sliney’s Ben Reilly: Scarlet Spider got a respectable twenty-five issues, but perennial low sales have finally ended the adventures of Peter Parker’s most famous clone. With the return of the original Wolverine, it seems time has run out for the time-displaced version. 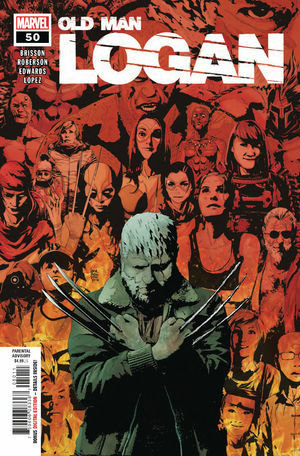 Ed Brisson and Braim Roberson’s Old Man Logan ended its run with issue #50 in October. The character is going to still be around for a while longer though, as the 12-part mini-series Dead Man Logan by Brisson and Mike Henderson starts in November. And finally, Moon Knight ended in October with a landmark issue #200 by Max Bemis and Paul Davidson, with guest artists Jacen Burrows, Jeff Lemire, and Bill Sienkiewicz. This volume was a bit odd. Originally by Jeff Lemire and Greg Smallwood, it seemingly ended with issue #14 in May 2017 before coming back in November of that same year with the new creative team of Max Bemis and Jacen Burrows, and new legacy numbering. 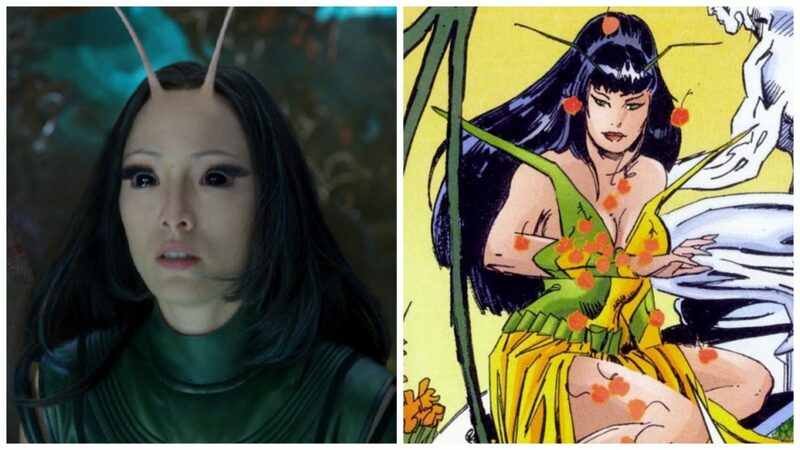 It’s being a busy fall for Marvel’s mutant characters. Extermination, which ended in early November, has featured a wide and diverse cast, and the new Uncanny X-Men series promises to feature an even larger cast in its weekly “X-Men Disassembled” storyline. And the mutant heroes aren’t the only ones getting the love. October featured five one-shots highlighting some of the X-Men’s most famous villainous characters. 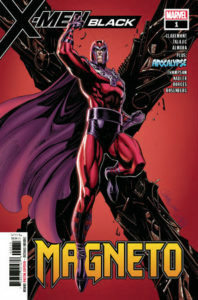 The most prominently-hyped one-shot was Chris Claremont and Dalibor Talajic’s X-Men Black – Magneto #1. Claremont’s long tenure on Uncanny X-Men took Magneto from a straight-up villain to a more morally complicated character, so I was cautiously hopeful to read his return to the character. Sadly, like much of Claremont’s more recent work, I found the issue incredibly preachy and heavy-handed, while decidedly lacking in actual plot. The standout to me was X-Men Black – Emma Frost #1 by Leah Williams and Chris Bachalo, in which the White Queen takes the spotlight, and an interesting new role within the Hellfire Club. Williams is a new-to-me author, but based on this issue I’ll definitely be picking up more of her work. Bachalo’s art can at times be too cartoony for my tastes, but nobody draws Emma Frost better. In addition, Seanan McGuire and Marco Failla put the spotlight on everyone’s favourite amoral shape-shifter to delightful, and murderous, effect in X-Men Black – Mystique #1, Scott Aukerman and Nick Bradshaw take on everyone’s least favourite TV executive in X-Men Black – Mojo #1, and Robbie Thompson and Shawn Crystal take a tour through Cain Marko’s past in X-Men Black – Juggernaut #1. The Return of the What Ifs? In October Marvel published a series of six “What If?” one-shots by different creative teams, most of the canon-divergence variety. What If? Thor #1 by Ethan Sacks and Michele Bandini asks, “What if… Thor was raised by the Frost Giants?” What If? Spider-Man #1 by Gerry Conway and Diego Olortegui starts with the question, “What if Flash Thompson became Spider-Man?” In What If? 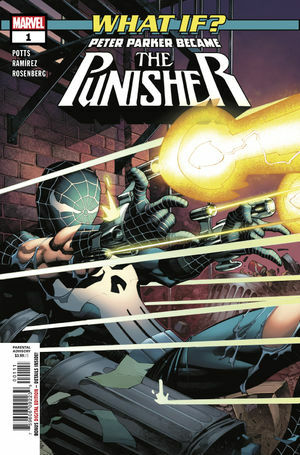 The Punisher #1, Carl Potts and Juanan Ramirez ask, “What if Peter Parker became the Punisher?” And What If? Magik #1 by Leah Williams and Filipe Andrade, “What If Magik Became Sorcerer Supreme?,” imagines a world where the X-Men’s Magik ends up as the apprentice and then successor to Doctor Strange. But wait: there’s more! 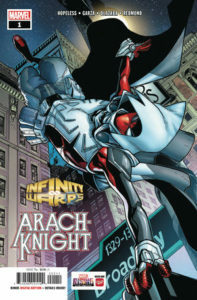 As part of Infinity Wars, Marvel introduced a number of “Infinity Warps” character mashups in their own two-issue series. 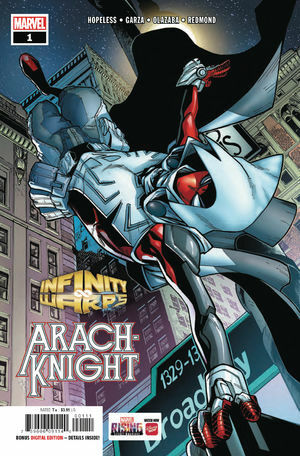 In October, Max Bemis and Alé Garza mashed up Spider-Man and Moon Knight in Infinity Wars: Arachknight and writers Ben Acker and Ben Blacker and artist Gerardo Sandoval combined Laura Kinney and Wanda Maximoff in Infinity Wars: Weapon Hex. And November brings one final series, the Black Panther and Ghost Rider mashup, Infinity Wars: Ghost Panther by Jed Mackay and Jefte Palo, as well as the one-shot Infinity Wars: Infinity Warps #1 Anthology which features Ryan North and Natacha Bustos’s Moon Girl/Squirrel Girl mashup “Moon Squirrel and Tippysaur” and Mariko Tamaki and Francisco Herrera’s “Green Widow,” which combines She-Hulk and Black Widow. In case you wondered if Marvel had realized how incredibly stupid mini-series made out of connected one-shots were, the answer is, alas, no. 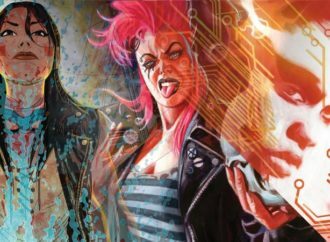 October kicked off a three-part Typhoid Mary story that will be told over three months in Typhoid Fever: Spider-Man #1 by Clay McLeod Chapman and Stephano Landini, Typhoid Fever: X-Men by Chapman and Will Robson, and Typhoid Fever: Iron Fist by Chapman and Paolo Villanelli. And starting in December most of the original Defenders will reunite in a story called “Defenders: The Best Defense” which will take place under six different titles: Immortal Hulk: Defenders #1 by Al Ewing and Simone Di Meo, Namor: Defenders #1 by Chip Zdarsky and Carlos Magno, Doctor Strange: Defenders #1 by Gerry Duggan and Greg Smallwood, Silver Surfer: Defenders #1 by Jason Latour, and Defenders: The Best Defense #1 by Al Ewing and Joe Bennett. Yes, the last issue of the “Defenders: The Best Defense” series is Defenders: The Best Defense #1, I’m sure that won’t confuse anybody. 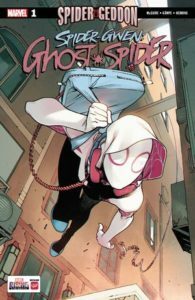 Dan Slott and Olivier Coipel’s 2014 event Spider-Verse brought together a huge range of alternate world spider characters, including new creations like Spider-UK, Spider-Punk and the wildly successful Spider-Gwen. 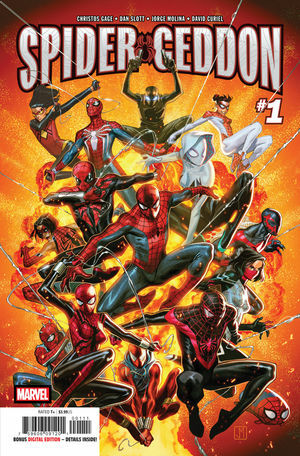 Now, Christos Gage and Jorge Molina have brought them back together in Spider-Geddon and not all of them are expected to survive. 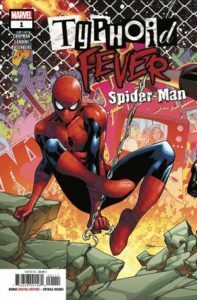 Just as I did with the original Spider-Verse, I’m reading some of the ancillary series and mostly ignoring the big event. For me the fun really is in discovering new and unique takes on Spider-Man, once the story turns into “and they all band together to fight bad guys,” I lose a lot of my interest. After we’d both read the first issue of The Unstoppable Wasp I asked Elizabeth what she thought of it. She said, “I wish I’d had this comic when I was thirteen.” I feel the exact same way. It’s not often that I can say there’s nothing I’d change about a comic, but I really don’t think there’s anything I would change about this issue. Nadia Van Dyne is such a vibrant, passionate hero. But she and her team of G.I.R.L. scientists are also entirely believable teenagers. Whitley and Gurihiru do a great job of introducing all the supporting characters in a brisk and efficient manner, but with enough detail of their personalities to make each one stand out as a distinct person. The burgeoning romance between Shay and Ying is particularly delightful. Meanwhile, Janet Van Dyne, as written by Jeremy Whitley, is exactly the kind of mentor I wish every teenager could have. It’s lovely to occasionally read a comic with only one named male character that doesn’t feel in any way contrived or gimmicky. Having that one male character be the long-suffering Avengers butler Jarvis, was an inspired choice. Gurihiru’s art is perfect for Nadia’s adventures. Light and playful, with a clear but not overwhelming manga influence that works particularly well for the subject matter. I particularly loved the sense of movement and motion in their layouts, and the way they were able to give each characters their own distinct look and feel. As a fan of Seanan McGuire’s novels, I was incredibly excited to see her writing for Marvel, first in the one-shots X-Men Gold Annual #2 and X-Men Black – Mystique #1, both of which were delightful, and now for the new volume of Spider-Gwen’s solo book. From page one it’s clear that McGuire and artist Rosi Kämpe have a good feel for Gwen and her world. Kämpe doesn’t make the mistake of trying to copy Robbi Rodriguez’s incredibly distinct art from Gwen’s previous series, but her layouts and Ian Herring’s colors both call back to Rodriguez’s style just enough to give a real feel of continuity between volumes. 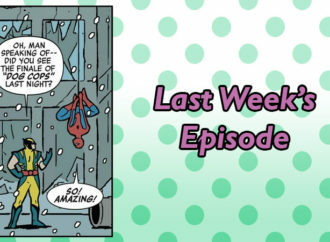 And McGuire definitely understands Gwen Stacy. She’s talked in interviews about the original Gwen Stacy being one of the first comic characters she loved, and that love really came across in this issue. My one regret is that they launched this new volume as a tie-in to Spider-Geddon event. For someone not reading the event, the brief intrusion of the Spider-Geddon storyline in the middle of this issue was confusing and distracting from a story that is strong enough to stand alone on its own merits. I like what I’ve read of Shuri in previous Marvel comics, and I adore the Shuri of the Marvel Cinematic Universe, but they are decidedly different characters. In Shuri #1, Nnedi Okorafor and Leonardo Romero attempt to merge those two characters—the youthful and light-hearted tech genius from the movies, and the more serious warrior and politician of the comics—with rather mixed results. 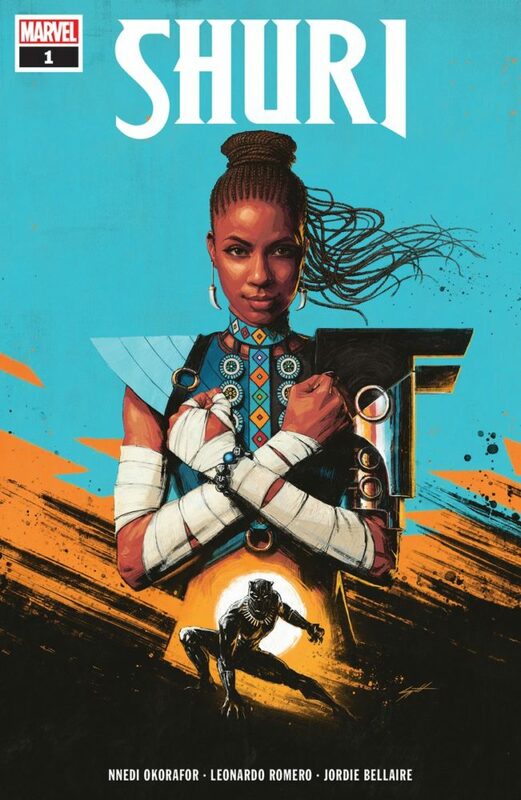 This Shuri is charming and charismatic, but I don’t see in her much of the Shuri who has been in Ta-Nehisi Coates’s Black Panther, which is awkward since this book directly ties into and jumps off from current events in that series. Okorafor references Shuri’s recent return from the Wakandan spiritual plane of the Djalia and the mystical powers she acquired there, but it feels more like a perfunctory nod to the character’s past, acknowledged and then forgotten. Okorafor’s writing is sometimes clunky and over-reliant on captions, as is often the case when a prose writer transitions to comics writing, but nevertheless the story moves briskly and the distinct character voices come through very clearly. Leonardo Romero and Jordie Bellaire’s art is bright and vibrant, emphasizing Shuri’s youthful energy and highlighting Wakanda’s unique blend of futuristic technology and pan-African iconography, and Sam Spratt’s cover is absolutely stunning, maybe the best cover of 2018. There’s a lot to like here, and I think this series will go over particularly well with new readers coming in from the movies, but ultimately it just didn’t quite work for me. I’ve always thought of Shatterstar as the quintessential Rob Liefeld creation: completely nonsensical yet dramatic costume, overly-complicated backstory, terrible hair, and way, way queerer than was probably intended. He was a perfect character for that moment in time, but difficult to make fresh and interesting for a modern audience. Somehow Tim Seeley and Carlos Villa have mostly managed to do just that. At least at the beginning this is a genuinely fresh take on Shatterstar, and I was unexpectedly charmed by it. 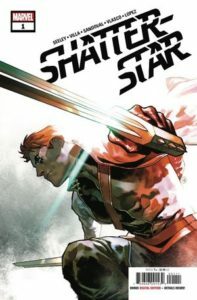 When the story opens, Shatterstar has put away his swords and uniform and settled down as a landlord, running a sort of halfway house for refugees and outcasts from parallel dimensions and alternate futures. The introduction of an entertaining and diverse cast of tenants with their own over-the-top backstories, combined with Villa’s clean, naturalistic art, manages to ground Shatterstar and make it feel like this is exactly where he should be. So, of course everything goes to hell. This is, after all, a comic book. It’s a fun story so far, but not without its flaws. The third-person narration is unnecessarily verbose and portentous at times and the inevitable twist that pulls Shatterstar out of his comfortable life is neither particularly clever or particularly surprising. Also, I disliked Gerardo Sandoval’s art in the flashback sequences, which I found messy and hard to follow, almost as much as I loved Villa’s art everywhere else. It’s not perfect, but Seeley and Villa won me over enough at the beginning, that I’m happy to keep reading and see where they go from here. 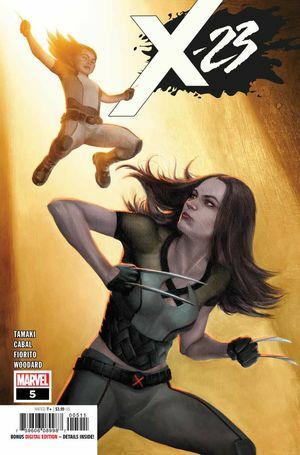 I’ve held off on reviewing the new volume of X-23 until I saw how this story was going to end. I love Mariko Tamaki’s writing, but the news that the Stepford Cuckoos would be the villains in the first arc left me more than a bit nervous. The Cuckoos are complicated and morally murky characters, but in general the surviving ones tend to come down on the side of good rather more often than not. I clearly should not have been worried. Tamaki portrays the Cuckoos and their complicated sisterhood with just as much nuance and sympathy as she does the stars of the book, Laura Kinney and her clone-sister Gabby. The comparisons drawn between the Cuckoos and the Kinney siblings help to ground the story and give it a nice depth. All clones, the Cuckoos want to rebuild the family they once had and lost, while Laura and Gabby are building for themselves the family they’ve never known. Juann Cabal and Marcio Fiorito’s art is pretty, but at times a bit too pared-down and static feeling, making some of the fight scenes, particularly the big final confrontation, hard to follow.